The season of throwing parties, hosting events and gathering everyone together for a celebration is here: Summer! 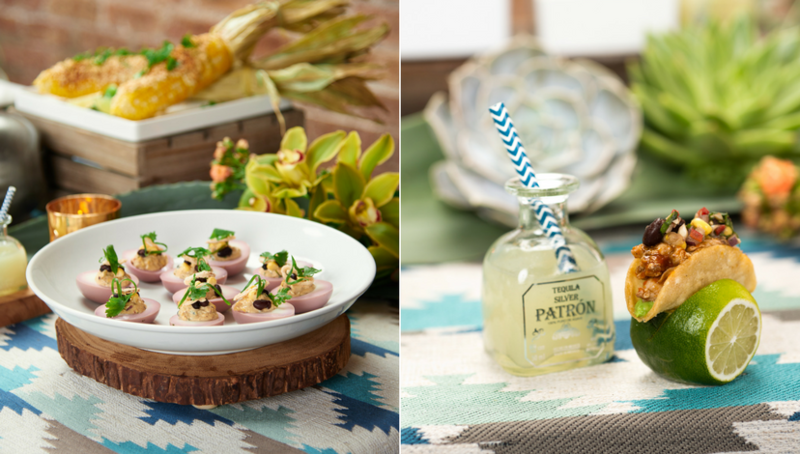 What party goes better with summer than a southwestern soirée? 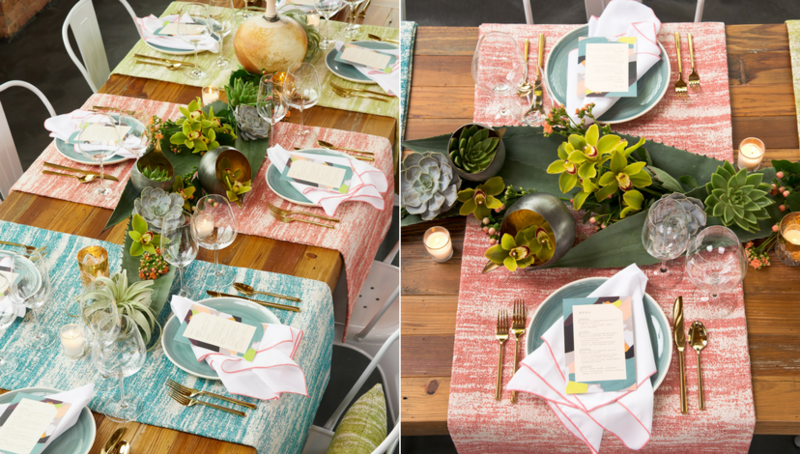 With BBJ Linen’s newest collection of linen, you can design a tablescape for the ultimate fiesta. 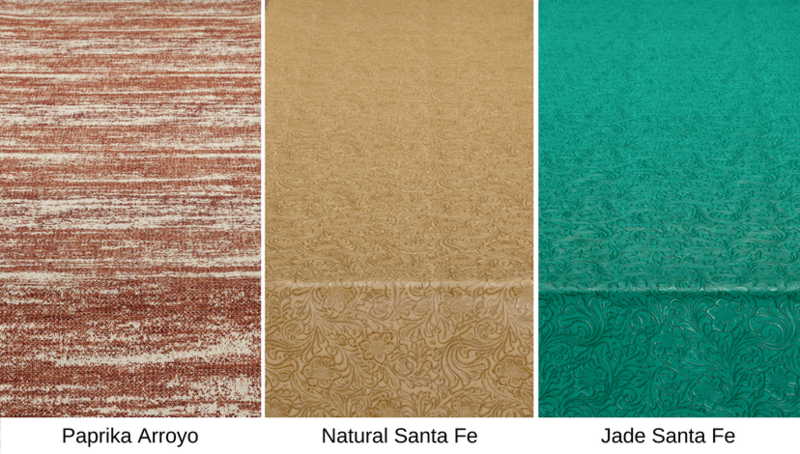 The Desert Horizon collection is stunning and has a distinct character of the desert Southwest, in all its variety. Know that whatever you choose, and however you choose to combine them, you can create table settings that are as unique as this enchanted land, with a warm and inviting interpretation of comfort that speaks welcome in many tongues! 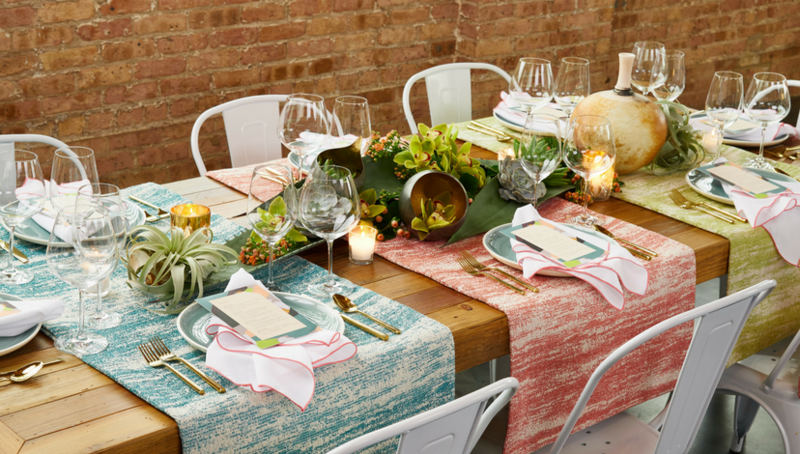 With our latest offer, Entertaining Guide: A Southwest Soirée, you’ll get a chance to see how to create the perfect summer tablescape and ways to incorporate the Desert Horizon collection. It’s all about unexpected contrast and stylized pattern. 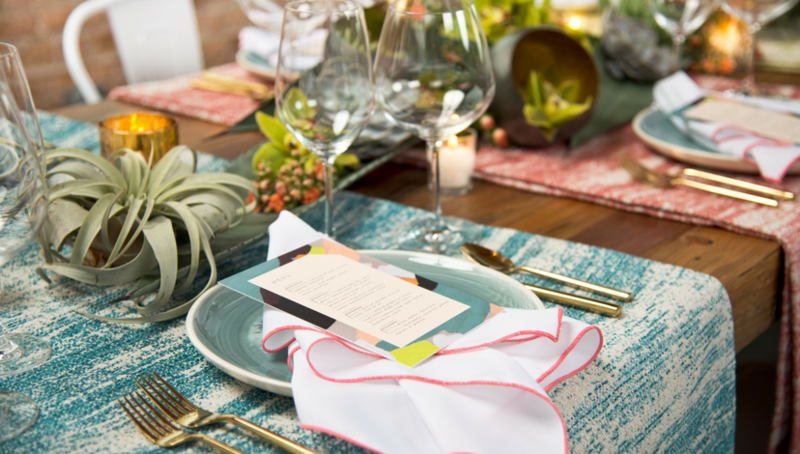 Making a first impression is crucial, and it all draws from your tablescape. Rusty metal, eroding cliffs, desert cactus, mountains at twilight all combine in this traditional thunderbird pattern. The images are sparked by this vivid pattern, but it’s also soothing and subtle in its own way. Be inspired by your venue to create a design worthwhile! The rich look of well-worn leather lends a familiar appeal to this runner, affording unique focus for a dinner or buffet table. 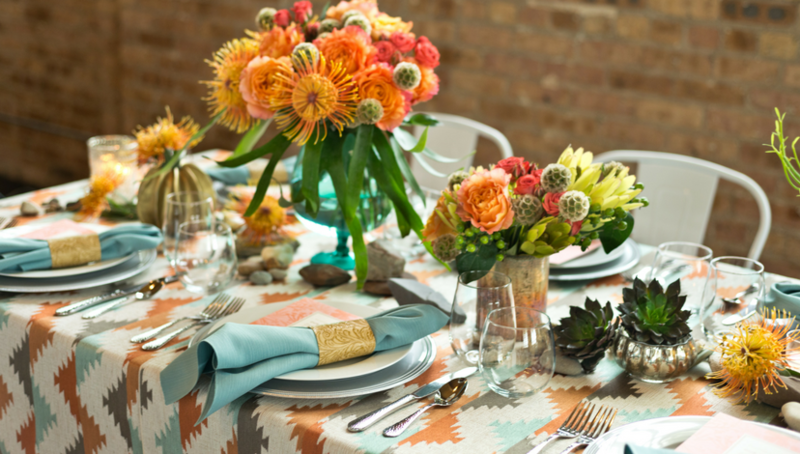 Personal touches add substance to the table and create the perfect amount of festivity. Great with natural wood, there’s little need for other pattern, but if you choose to add color and texture, Black Rawhide becomes a willing partner. As spicy as a ripe chili or the sun setting over the desert expanse, Paprika Arroyo will drench any setting with Southwest spirit. 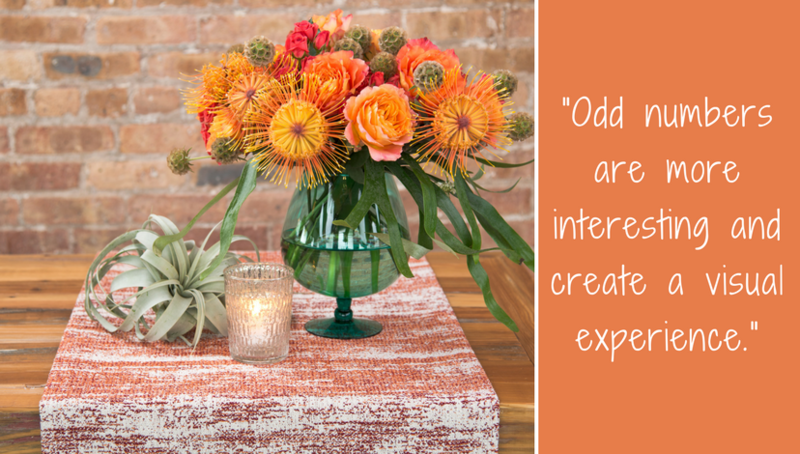 Placing arrangements in odd numbers are more interesting and create a visual experience. Keep it hot with glowing copper, cool the scene with a silvery shine, or introduce the mysterious glint of gunmetal; this is a linen you’ll find to be infinitely versatile. 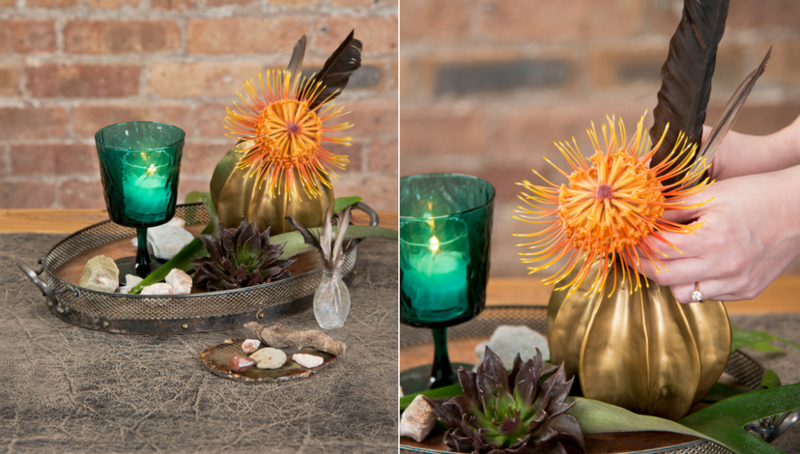 Creating the perfect cocktail table makes mingling easy. 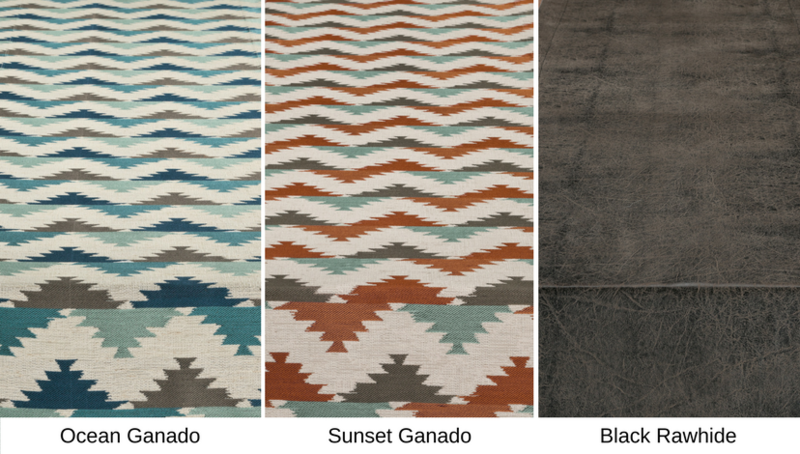 An intricate design of Spanish influence as well as the natural beauty of the high desert is combined in this ornate pattern that features saturated tone on tone color. The city itself is known for the quality of its light, and that is reflected in the golden glow of this beautiful linen. Compliment custom cocktails by selecting the jewel-tone shimmer of rich jade as an elegant counterpoint. This swirling pattern of leaves and flowers has sophisticated overtones, but use it in tandem with blanket patterns and earthy woven linen for a distinctly Southwestern vibe. Trending now: bite-size appetizers. Compliment these one-of-a-kind appetizers with Ocean Ganado. It’s bold and stimulating, but the desert’s minerals and gemstones inspire the colors. 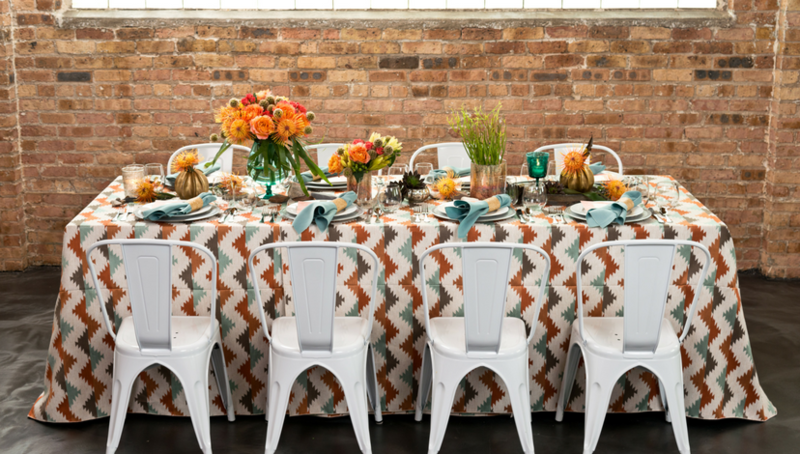 This new pattern is perfectly suitable as a backdrop for colorful, regionally inspired food favorites. Planning a feast that includes salsa and chips, mini tacos, roasted corn and tequila cocktails? This is the perfect choice! 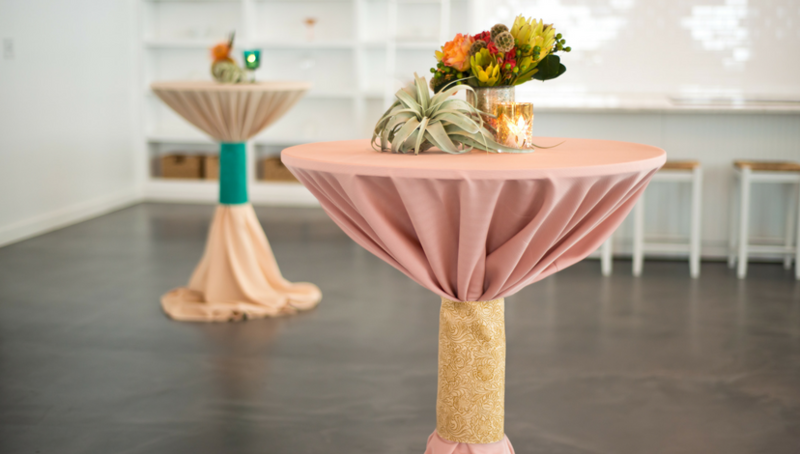 Enhance your dining experience with not only one colored runner, but three! 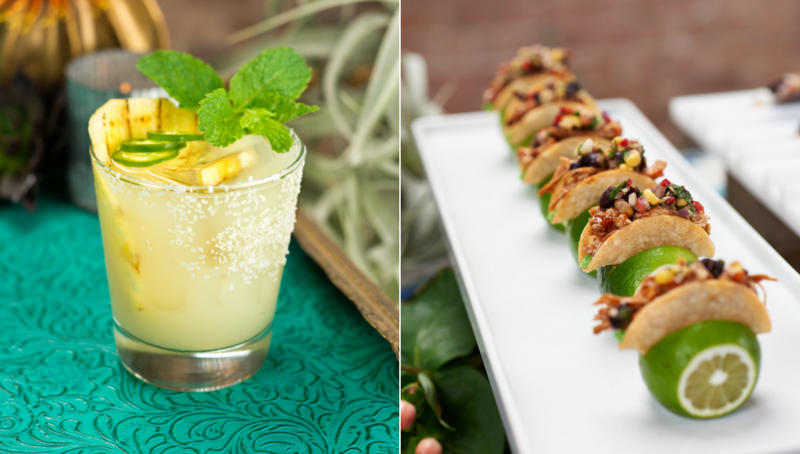 Pico Arroyo, Cilantro Arroyo and Agua Arroyo are calculated pairings designed to make your dining experience beautiful and vibrant. Pico is as quintessentially Southwest as the red rocks of Sedona — not red, really, but a breathtaking barrage of rosy colors that reflect the light and take one’s breath away. 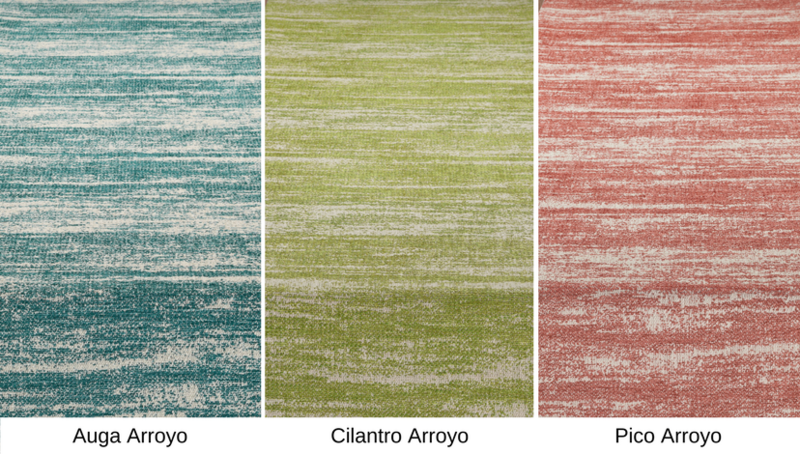 Cilantro Arroyo is the refreshing colors of tangy cilantro and natural wheat. Agua Arroyo makes you think of the grey-green of pinion pines on low hills, or the deep greenish-turquoise of gems chipped from the ground. 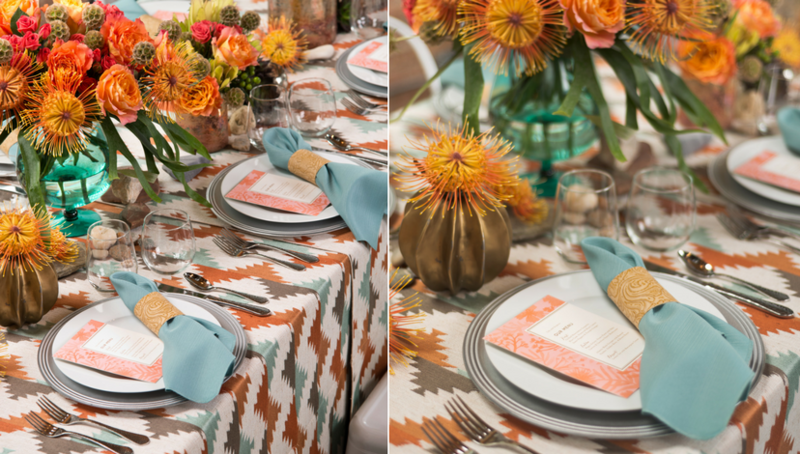 Collaborating bold and unique colors balances the color palette and only enhances the experience your guests will be having with the food. 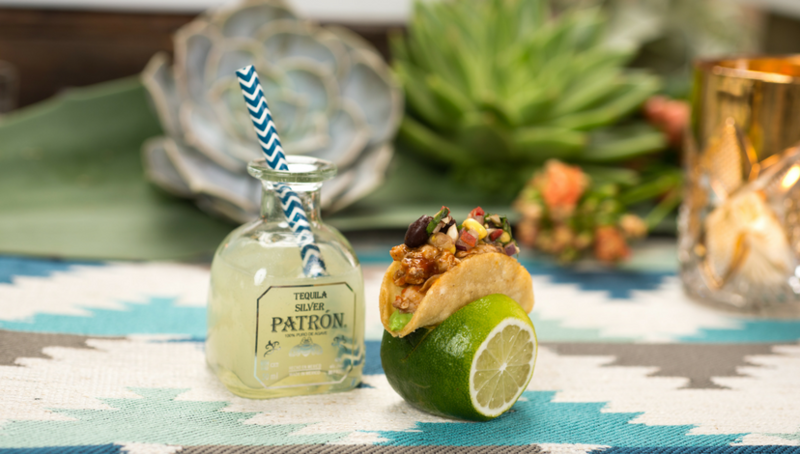 The Desert Horizon is just the thing you need to create the perfect summer event. However, our entertaining guide is something you can take with you from event to event throughout the year. Stay with the current trends and don’t lose sight of what is most important: having a great time with your guests.